Doctor Who: DEEP BREATH Spoiler Free Review | Warped Factor - Words in the Key of Geek. Doctor Who launched its eighth 21st century series on a glorious Thursday afternoon in Cardiff. Tony Fyler sent this review. Whenever the Doctor regenerates what we know is that his personality will change radically. What doesn’t always happen is that the whole tone of the show changes at the same time. Certainly, that happened when Matt Smith took over the role, ushering in the ‘fairy tale’ era. The fairy tale’s over. They didn’t all live happily ever after. There are ways in which Capaldi’s first full outing as master of the Tardis is standard regeneration fare – there’s some gabbling, some falling over, the Doctor spends at least a little time asleep. There’s also a degree to which, if you wanted to be hyper-critical, you could say that the villains here are re-trodden from a previous story, the method of the Tardis’s arrival is wasteful and gimmicky, and the whole thing feels to some degree like another Moffat pitch for a Paternoster spin-off. You’d have to be extra-specially hyper-critical to seriously make those claims as particular detractions from Deep Breath though, because really, the story’s stronger and the performances more impressive than any of these things. At the risk of a possible spoiler, there’s a question on this website somewhere to which the answer is an emphatic and crowd-pleasing ‘yes’ – and even moreso for the improvements made. Capaldi’s Doctor will thrill anyone who loves Jon Pertwee’s inaugural story Spearhead From Space (and who doesn’t? ), and there’s more than a dash of Pertwee’s action heroism about Capaldi’s first outing. It’s not quite a wheelchair chase, but it’s got the same mad, irrepressible energy in the first half. There’s also the delightful revival of a fan favourite verbal tic of Tom Baker’s – you won’t fail to notice it when you see or hear it. 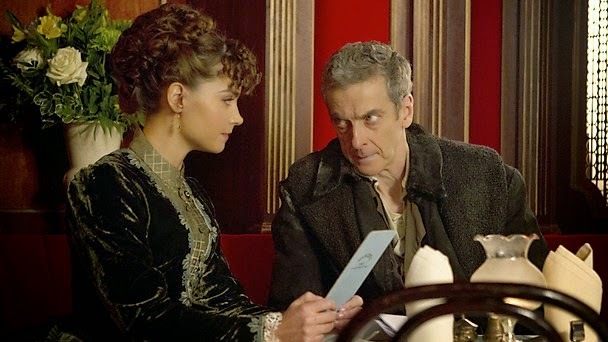 The critics waiting to pounce are roundly addressed – Capaldi’s accent and age are both hilariously tackled. His age and the familiarity of his face also get a dramatic reckoning, and Capaldi plays his post-regenerative journey with rather less shilly-shallying than other recent Doctors – as the episode progresses, his Doctor simply gets more and more clear-headed, stronger, and yes, not a little more scary. So much so that while this Doctor is himself for around the last two-thirds of the episode’s hour-long running time, there’s a sense that this regeneration has had more profound, more hidden consequences, that even he doesn’t fully appreciate yet. The idea of the series as a potential journey into darkness feels, from the tone here, like the darkness left I the Doctor’s ‘soul’ by his latest change of body. Certainly his final showdown with the lead villain delivers everything you could wish for in a ‘Dark Doctor’ – a dark, quiet, ‘gunslinger in the OK Corral’ prelude, a great, and this time growled, affirmation of his dedication to humanity, a physical battle, a moment of potentially really dark deceit, and a shocking, and as yet unresolved ambiguity. It’s a fantastic sequence, which is less roller-coaster, and more a series of enjoyable punches to the face. While Capaldi is hypnotic whenever he’s on screen, the episode has a Tardisload of other great scenes too. Jenna Colemen’s Clara in particular has great scenes with all of the Paternoster Gang individually, taking her through the companion’s dilemma when regeneration pulls the rug of their life out from under them. She shares comedy-sidekick banter with Strax, tender friendship with Jenny, and an exchange of furies with Vastra that makes you sit up straighter. Vastra herself says ‘I always wondered what you’d be like if you got angry.’ For those who think of Clara as a kind of 21st century omni-poppet, watch this episode and see the real woman emerge from beneath the companion’s burden of sassiness. She also has a cracking solo scene with the lead villain, drawing on her life experience to bamboozle it despite her fear, and also, ultimately with the Doctor himself, leading to a scene which is already common knowledge over the fandom-net, but which Steven Moffat specifically asked the audience not to reveal. You know…that scene. This being a Steven Moffat episode, there are the makings of a new schoolyard game at the core of the story, though one that might have children turning blue on playgrounds up and down the country. And the lead villain, despite being an obvious re-tread of a previous Moffat creation, is both written and played in such a way as to add substantively to the original and give it a fresh twist with an oddly delicious anti-religion riff, which Capaldi plays with a definitely Tuckeresque brutal brilliance. The so-called ‘gay agenda’ gets a pleasant nod, and just in case you thought we’d seen the last of them, there’s the beginning of another Moffat story arc right at the end. Enjoy! But ultimately, what you need to know about Deep Breath are the change in tone, from champagne cocktail to straight bourbon, and Capaldi’s Doctor. Bold, adventurous, assured, gritty, Sherock-smart, personally vulnerable and something beyond mesmeric, Capaldi brings some of the best elements of the 70s Doctors, adds a pinch of McCoy’s manipulation, and sears his new interpretation onto 21st century Who. Buckle up, Whovians- the ride of your life is beginning all over again.